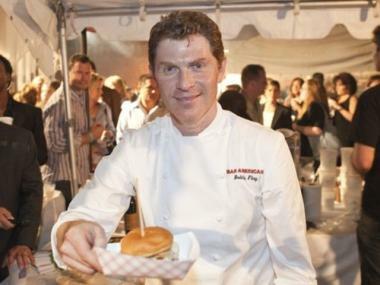 Bobby Flay will settle a lawsuit with his former workers for $800,000. MANHATTAN — Food Network star Bobby Flay has agreed to pay $800,000 to workers who allege they were cheated out of wages and tips while working at his popular Manhattan eateries. Flay denied any wrongdoing, but in court documents said he would rather settle with the workers than go to trial. When reached by phone, Eli Zev Freedberg, the attorney representing Flay and the rest of the defendants listed (KBFK Restaurant Corp. and Bold Food LLC), declined to comment. A federal judge scheduled a hearing for June 22 to consider the deal, which the employees have already accepted. The suit was originally filed in January by three servers from Flay's Bar Americain on W. 52nd Street. By the time the “Iron Chef” agreed to settle, the list had grown to five plaintiffs and included workers from Flay’s two other Manhattan restaurants, Mesa Grill and the now-closed Bolo. In the suit, the workers claim Flay forced them to buy and launder their own uniforms, and didn’t give them a share of the mandatory tips charged to private-party tabs. The servers are being represented by Justin Swartz, a Manhattan-based lawyer who has won lawsuits against the owners of Shelly’s Prime Steak, Tao and Buddha. Swartz did not immediately return a call for a comment.